A pair of Perla armchairs designed by Giulia Veronesi and produced by ISA Bergamo, Italy. Its sensual curves and the elegantly tapered legs give the chair a sculptural and modern feel. 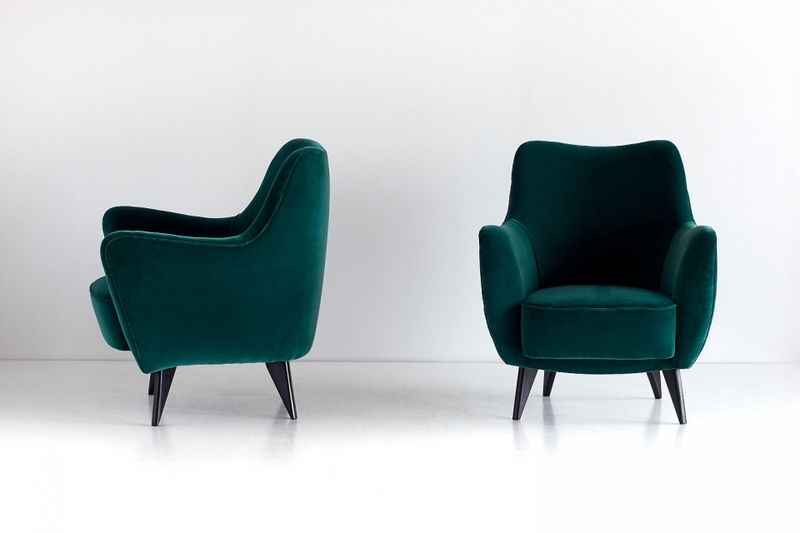 These sumptuous armchairs have been fully reconditioned and newly upholstered in a deep green Kvadrat ‘Harald’ velvet, a fabric designed by Fanny Aronsen and Raf Simons. Additional note: The designer has been credited as G. Veronesi in the ISA advertisement in Domus. Previously, Guglielmo Veronesi was assumed to be the full name. However recent research has indicated it was in fact Giulia Veronesi who designed the Perla chair and sofa. Condition: excellent, fully reconditioned and newly upholstered in a deep green Kvadrat velvet.